Howard Mandel, author of "Miles Ornette Cecil: Jazz Beyond Jazz," was interviewed by BBC Newshour that night. Mandel noted that the Kyoto is Japan's Nobel, except it also includes musicians. This is the first time Japan has awarded this prestigious and lucrative prize to a working jazz musician. You can hear Howard's vivid profile of Cecil here, starting at 45:29. Synchronicity: On Wednesday, at a reception for Ragamala Dance and saxophonist/composer Rudresh Mahanthappa, who are working together on a new Walker Art Center commission, I met Herman J. Milligan Jr., an arts supporter, Artspace board member, and jazz musician who was a student at the University of Wisconsin-Madison when Taylor was artist-in-residence there. (Hiring black faculty was among the demands of striking students at UW-Madison in the late 1960s.) Milligan spoke about playing in an ensemble with Taylor, transcribing his music, and spending countless hours in practice and rehearsal. 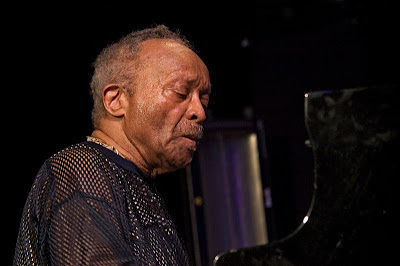 I've seen Cecil Taylor live only once, at the Ted Mann Concert Hall in Minneapolis on February 19th, 2000. The now-on-hiatus Northrop Jazz Season and the Walker Art Center had partnered to bring him here. According to the Walker website, he performed with his new quartet: Joe Locke on vibes, Santi Debriano on bass, Jackson Krall on drums. Another website, Cecil Taylor Online Sessionography, has him playing with his trio that night, with Dominic Duval on bass and Jackson Krall on drums. Which is correct? I'd love to know, since the question of who Taylor played with that night has come up in conversation many times since then. I remember that 55-minute opening improvisation, because as soon as it ended and intermission began, people fled the Ted Mann en masse, which meant that HH and I could move closer to the stage. I was fascinated. I had never heard or seen a performance like that in my life. I seem to recall his bassist (Duval or Debriano? I'm pretty sure it was Duval -- I'm picturing a white man, with long hair) laying his bass on the floor and kicking it, but that could have been something I dreamed later. When the concert was over, I felt I should receive a diploma -- that I had graduated from a crash course in free jazz/improvised music. Taylor reached into my head and opened my mind. He opened it in such a way that it has stayed open ever since. I knew from that point on that I could listen to anything. That didn't mean I would like everything I heard, just that I could listen without being put off or intimidated. In March 2009, I spoke with photographer and filmmaker Chris Felver, whose documentary film "Cecil Taylor: All the Notes" was screening at the Bryant Lake Bowl on March 5. Felver said it took him "probably 20 years" to make the film, and that "I had to hang out with Cecil for 10 years to find out what the hell he was doing." Herman Milligan remembers meeting Felver when he was following Cecil Taylor around. These are all small stories, the sort that many people who hear a lot of live jazz gather over the years. You store them away and forget them until something like the Kyoto comes along and you remember them again. I'm glad to learn that Taylor, now 84, has won this award. Maybe more people will become aware of him as a result. Maybe someone can update the information that pops up when you do a Google search for his name. He didn't die in 1981, and his last album was not "Jazz; The Smithsonian Anthology." If you happen to be in Willisau, Switzerland in September, he's playing a solo set there. Taylor played with Duval that night for sure. I forget who the drummer was. But I'd never forget Duval. Duval and Krall. Duval was extremely over-amplified and self-absorbed. Krall regularly defaulted to bass drum bombs while simultaneously grabbing/muting his ride cymbal. Taylor was characteristically excellent. And while this music was allegedly released on Cadence Jazz Records as "All The Notes", the music on the CD struck me as an altogether different, and, as concerns the contributions of Duval and Krall, much stronger concert.